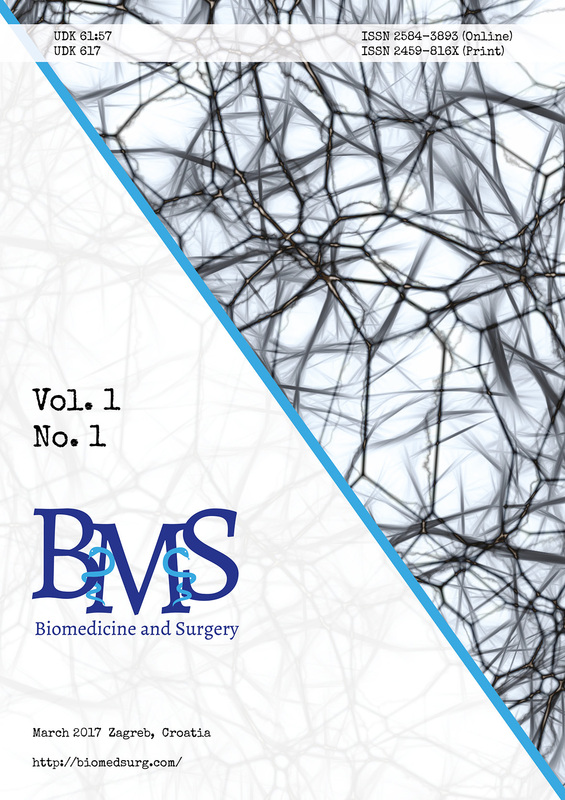 Biomedicine and Surgery publishes original scientific papers, reviews and case reports in fields of biomedicine, public health and surgery. All articles must be written in English. Manuscripts containing original material are accepted for consideration on the understanding that the material has neither been published previously (except in form of an abstract) nor is under consideration for publication elsewhere and that its publication is approved by all coauthors. With delivery of the manuscript for publication and the subsequent acceptance by the Editor, the author transfers all necessary copyrights for publication and distribution to the publisher. All scientific material is subject to a peer-reviewing process by the editors and external experts. The authors are encouraged to propose up to five names of potential reviewers, but, obviously, the editors reserve the right of final selection. Manuscripts submitted for publication must contain a statement to the effect that all human studies have been approved by the appropriate ethics committee and have therefore been performed in accordance with the ethical standards laid down in the 1964 Declaration of Helsinki. It should also be stated clearly in the text that all persons gave their informed consent prior to their inclusion in the study. Details that might disclose the identity of the subjects under study should be omitted. Authors must indicate whether or not there is a financial relationship between them and the organization that sponsored the research. This note should be added in a separate section previous to the reference list. If no conflict exists, authors should state: “The authors declare that there is no conflict of interest”. A separate statement is required for every individual author of a manuscript and should be submitted together with the manuscript. Manuscripts must be submitted using the online submission system. In case you encounter any difficulties while submitting your manuscript online, please get in touch with the responsible Managing Editor by clicking About from the main menu. Please do not send any hard copies of the manuscript. Manuscripts should be submitted in .doc compatible format. Use 12-point Times Roman font, double-spaced throughout the manuscript. All pages should be numbered in Arabic numerals, starting from the title page, with numbers in the bottom right corner. Do not use field functions. Use tab stops or other commands for indents, not the space bar. Abbreviations should be defined at first mention and used consistently thereafter. The presentation of the typescript should be in accordance with the International Committee of Medical Journal Editors’ “Uniform requirements for manuscripts submitted to biomedical journals” (see N Engl J Med 1991;324:424–8 or Br Med J 1988;296:401–5). This is an example title. Running title: Short running title. Running head (short title up to 40 characters with spaces). Surgical resection of pancreatic cancer offers the only chance for prolonged survival. Pancretic resections are technically challenging, and are accompanied by a substantial risk for postoperative complications, the most significant complication being a pancreatic fistula. Risk factors for development of pancreatic leakage are now well known, and several prophylactic pharmacological measures, as well as technical interventions have been suggested in prevention of pancreatic fistula. With better postoperative care and improved radiological interventions, most frequently complications can be managed conservatively. This review also attempts to address some of the controversies related to optimal management of the pancreatic remnant after pancreaticoduodenectomy. AIM: We conducted ultrasound-guided single-shot supraclavicular blockade and investigated the analgesic effect of dexamethasone added to levobupivacaine. The aim of this study was to determine whether the addition of low-dose dexamethasone to levobupivacaine would prolong the duration of analgesia sufficiently to avoid additional intravenous analgesic use for the first 24 hours postoperatively. METHODS: This randomised controlled study assessed 70 patients undergoing upper-extremity surgery. Patients were eligible if there 18 years or over with American Society of Anaesthesiologists (ASA) physical status I, II or III. Patients were randomly assigned to receive 25 ml 0.5% levobupivacaine plus four milligrams dexamethasone (group 1) or 25 ml 0.5% levobupivacaine plus one millilitre saline (group 2). Pain scores, analgesic consumption and time estimation at which they perceived that sensory and motor blockade started and resolved were recorded. RESULTS: Duration of sensory (1,260 min. in group 1 vs 600 min. in group 2) and motor (1,200 min. in group 1 vs 700 min. in group 2) blockade were significantly longer in group 1 (P < 0.05). Postoperative pain levels in group 1 were significantly lower (P < 0.05) at all investigation times. Analgesia consumption was significantly lower (P < 0.05) in group 1; at six and 12 hours, no patient required additional analgesia, and at 24 hours, only two patients compared with 17 in the levobupivacaine group required additional analgesia. CONCLUSION: Using single-shot low-dose dexamethasone in a mixture with levobupivacaine results in prolonged analgesia duration and less analgesic use compared with levobupivacaine alone. The Abstract must not exceed 250 words and should not contain references or abbreviations. It should be comprehensible to the non-specialist medical reader. The purpose of the investigation, the basic procedures, the main findings and the principal conclusions should be clearly stated. Submission of structured abstracts is encouraged. Three to five Keywords should be listed after the abstract. These should be taken from the Index Medicus Thesaurus of Medical Subject Headings (MeSH) whenever possible. You can find MeSH terms here. The Introduction should describe the background and rationale for the study in a way which is comprehensible to the general medical reader. Abbreviations used in the text must be explained at their first appearance. The Materials and Methods section should give a concise account of clinical details of the subjects studied, of the procedures, equipment, and materials employed. The statistical methods used to evaluate the results must be described. Generic names should be used for drugs; if the trade name is mentioned, the manufacturer should be stated and the chemical composition specified. The Results section should present the findings, supported by appropriate statistical analysis, but without discussion. Numerical data presented in tables or figures should not be duplicated in the text. The Discussion section should summarize the findings presented in Results and compare them with existing knowledge and state the tentative conclusions. Zhang L, Huang Y, Hong S, Yang Y, Yu G, Jia J, Peng P, Wu X, Lin Q, Xi X, Peng J, Xu M, Chen D, Lu X, Wang R, Cao X, Chen X, Lin Z, Xiong J, Lin Q, Xie C, Li Z, Pan J, Li J, Wu S, Lian Y, Yang Q, Zhao C. Gemcitabine plus cisplatin versus fluorouracil plus cisplatin in recurrent or metastatic nasopharyngeal carcinoma: a multicentre, randomised, open-label, phase 3 trial. Lancet. 2016;388(10054):1883- 1892. Zhang L, Huang Y, Hong S, Yang Y, Yu G, Jia J, Peng P, Wu X, Lin Q, Xi X, Peng J, Xu M, Chen D, Lu X, Wang R, Cao X, Chen X, Lin Z, Xiong J, Lin Q, Xie C, Li Z, Pan J, Li J, Wu S, Lian Y, Yang Q, Zhao C. Gemcitabine plus cisplatin versus fluorouracil plus cisplatin in recurrent or metastatic nasopharyngeal carcinoma: a multicentre, randomised, open-label, phase 3 trial. Lancet. 2016;388(10054):1883- 1892. doi: 10.1016/S0140-6736(16)31388-5. Watkins PJ. ABC of Diabetes. 5th ed. London: Blackwell Publishing; 2003. European Space Agency. Rosetta: rendezvous with a comet. Available from: http://rosetta.esa.int [Accessed 15th June 2015]. References may be made to published work and papers in press. Reference citations are not permitted in the abstract of a paper. Authors are responsible for the accuracy of all literature citations. Work in progress, in preparation, unpublished work, and personal communications should be cited inside the text in parentheses. References should be listed numerically in the text in the order of appearance as parenthesized consecutive numbers, e.g., (1, 2). Where there are more than two references, the citation should appear as hyphenated numbers, e.g., (1–3). Table 1. Example of a table for BioMedicine and Surgery Journal (notice period at the end). Each table must start on a separate page and be inserted between the reference list and the figure legends. Use the table function, not spreadsheets, to make tables. Do not draw lines inside tables. All tables are to be numbered using Arabic numerals. Tables should always be cited in text in consecutive numerical order. For each table, please supply a table caption (title) above the table. Identify any previously published material by giving the original source in the form of a reference at the end of the table caption. Footnotes to tables should be indicated by superscript lowercase letters (or asterisks for significance values and other statistical data) and included beneath the table body. Figures must be numbered consecutively. The number of figures must be kept to a minimum consistent with the clarity of the text and should not repeat numerical data presented in tables or text. Color illustrations will be accepted but may incur extra costs for reproduction. Numbers, symbols, and lines must be of a size sufficient for easy reading after appropriate reduction of the figure to fit the column width. Each figure must be accompanied by a brief self-explanatory legend, which includes a definition of all symbols and abbreviations used in the figure. The legends of figures must start on a new page, after tables. Halftone figures: For an acceptable reproduction in color a resolution of 300 dpi is necessary. The figures must be converted to CMYK-model and stored as tiff-file (24 bit). Monotone figures must be stored in a grayscale model (8 bit) with the same final resolution. Line drawings: All figures (colored or black & white) including line arts and text labelings created with a drawing programme (Adobe Illustrator, Macromedia Freehand, CorelDraw) should be stored in eps-format. Scanned images should be stored as bitmap-file with a resolution not less than 800-1200 dpi. The used fonts must be embedded in the file to avoid changes or lost characters. Do not use presentation programmes (e.g., PowerPoint) or files downloaded from the internet to submit figures; in most cases, data cannot be processed. Use the Internet as far as possible for any correspondence with the editorial office, either by sending an e-mail to editor@biomedsurg.com or using the contact form.